Every company aspires to be a top value creator. Relatively few actually achieve this—and even fewer are able to sustain top performance over time. Doing so requires continually revisiting a company’s value creation strategy and adapting it to changing circumstances and new starting positions. One of the most powerful ways to drive continual adaptation is active portfolio management. That is why we focus on that topic in this year’s Value Creators report. We begin by reviewing the world’s leading large-cap value creators for the five-year period from 2011 through 2015 in order to explore the dynamics that make sustaining superior value creation such a significant challenge. Exhibit 1 lists the top ten value creators among the world’s 200 largest companies. The ranking is based on average annual total shareholder return (TSR), which measures the combination of the change in share price and the dividend yield for a company’s stock over a specific period. TSR is the most comprehensive metric for value creation and the shareholder’s true bottom line. (See “The Components of TSR.”) Average annual TSR is the amount of TSR that a company delivers, on average, in each of the five years in our analysis. Another interesting finding in this year’s large-cap top-ten ranking is that five of the companies—Regeneron, Netflix, Visa, KDDI, and MasterCard—are all newcomers to the list. Meanwhile, three—Allergan (the successor to Actavis, which acquired Allergan in 2015), Naspers, and Biogen—are appearing in the top ten for the second time; and one, Gilead, for the third. The only company on this year’s list that has appeared in our large-cap ranking for more than three years is the Chinese social media powerhouse Tencent, which has made the top ten for six years, five of which were consecutive (2010 through 2014). That kind of consistency is exceedingly rare. In the 18 years BCG has been publishing the Value Creators rankings, 89 companies have made it into the large-cap top ten. More than half, however—46 companies—have done so only in a single five-year period. In other words, those companies broke into this select group only to disappear from it in subsequent years. Only 19 companies (roughly 21% of the 89 companies that have made it into the top ten) have appeared on the list for three years or more. (See Exhibit 2.) The only company to surpass Tencent’s sustained performance has been Apple, which first appeared in the large-cap top ten in 2006 and stayed on the list for the next eight years, through 2014; however, the company has not appeared in the top ten since then. Second, because a company’s future value-creation prospects are strongly influenced by its current position, executives should regularly reconsider their value creation strategy as the company’s position evolves, adapting the strategy to new circumstances and new industry trends. One of the most effective ways for a company to refresh its value creation performance is by actively managing its corporate portfolio—by defining the roles of the businesses, products, and other key assets in the portfolio, allocating capital and other resources according to those roles, among other things, and reshaping the portfolio over time through acquisitions and divestitures. See Value Creation for the Rest of Us, BCG’s 2015 Value Creators report, July 2015. This report is a product of BCG’s Corporate Development practice. The authors would like to thank their BCG colleagues Danny Friedman, Ketil Gjerstad, Nick Glenning, Jens Kengelbach, Jesper Nielsen, Alexander Roos, and Peter Tollman. The authors would also like to thank Robert Howard for his contributions to the conceptualization and writing of this report and Martin Link for contributions to the research. Finally, the authors wish to thank Katherine Andrews, Gary Callahan, Kim Friedman, Abby Garland, Amy Halliday, and Sara Strassenreiter for their contributions to the report’s editing, design, and production. Total shareholder return (TSR) measures the combination of share price gains (or losses) and dividend yield for a company’s stock over a given period. It is the most comprehensive metric for assessing a company’s shareholder-value-creation performance, preferred by investment funds to measure business performance and, in some locations, a requirement for regulatory compliance. TSR is the product of multiple factors. 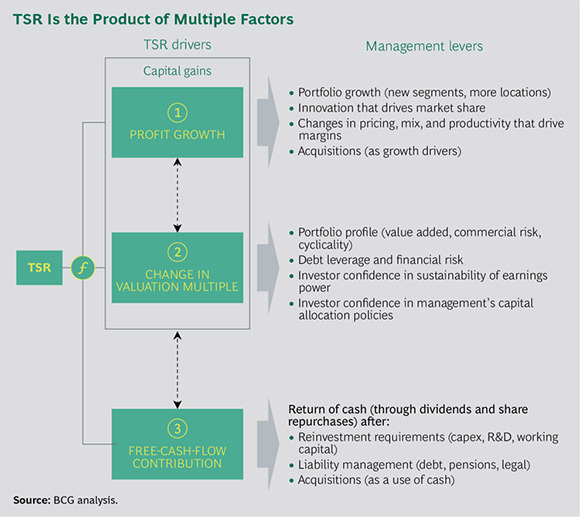 Regular readers of the Value Creators report will be familiar with BCG’s model for quantifying the relative contributions of TSR’s various sources. (See the exhibit below.) The model uses the combination of revenue (sales) growth and change in margins as an indicator of a company’s improvement in fundamental value. It then uses the change in the company’s valuation multiple to determine the impact of investor expectations on TSR. Together, these two factors determine the change in a company’s market capitalization and the capital gain or loss to investors. Finally, the model tracks the distribution of free cash flow to investors and debt holders in the form of dividends, share repurchases, and repayments of debt to determine the contribution of free-cash-flow payouts to a company’s TSR. All these factors interact with one another—sometimes in unexpected ways. A company may grow its revenue through an EPS-accretive acquisition yet not create any TSR because the acquisition erodes gross margins. And some forms of cash contribution (for example, dividends) have a more positive impact on a company’s valuation multiple than others (for example, share buybacks). Because of these interactions, we recommend that companies take a holistic approach to value creation strategy.